Why Choose Skyland Tourism For Desert Safari Dubai? These kind of tour companies are low in business & hire freelancers in cheap prices that always come late for pickup, they don’t talk while on the tour due to poor speaking skill and language grip, they don’t let you know what’s going on, & they nickel-&-dime you for little thing inside the desert safari camp for getting more & more commission. They hold illegal cars & “believe it or not” many of drivers don’t have Driving License as well. So, we are pioneer in desert safari services, get the best VIP desert safari services from Skyland Tourism, We have some options for you, you can choose any of the given below desert safari deals as per your budget and time. We are providing low price, best quality services in town. 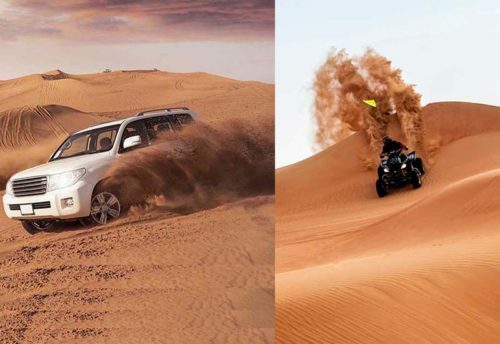 What are different options at the Dubai Desert safari? 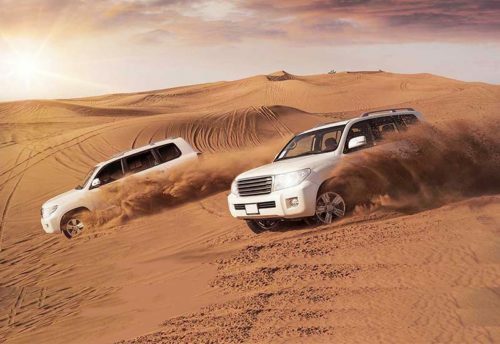 We have the best desert safari dubai. This is one experience you can’t miss when in Dubai. Choose from the many options we offer! 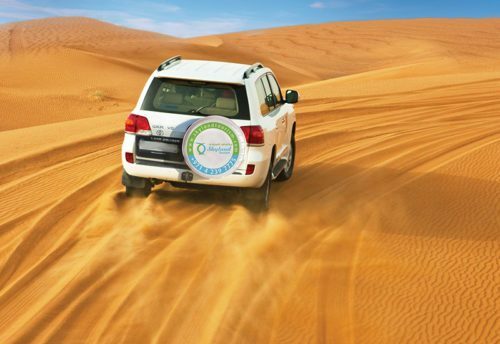 Our desert safari drivers are all professional and have a passion for giving you a thrilling ride. So all you need to do is mail us and we will take care of the rest.Here are some options that you need to select from. Extend your heritage experience with an overnight desert safari camping experience at our camp. Take a step back in time and experience Dubai as it was 50 years ago. As our guest, we will demonstrate cultural activities such as henna, music, dance, bread making and Arabic coffee making before enjoying a scrumptious dinner under the stars. Whatever tour package you choose, you can be sure that you will have a fun-filled and memorable tour experience that will burn in your memory. 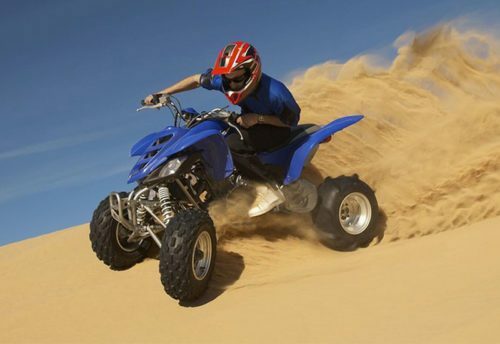 Early in the morning, as informed, we will pick you for Morning Dune Bashing Desert Safari in Dubai from the hotel arranged for your stay. Be seated in the Luxurious land cruiser and refresh yourself with soft drinks mineral water, etc. which will be available in the car. While you enjoy your drive through Dubai city you will get to see the morning view of Dubai, which is fascinating. As you drive further, you will be captivated by the soothing beauty of daybreak and the thrilling activities awaiting you in the Skyland Tourism. 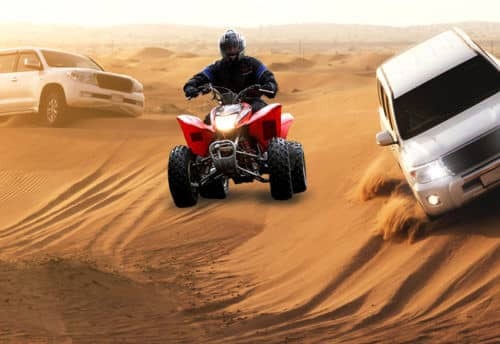 Early in the morning, as informed, we will pick you for MorningDune Bashing Desert Safari in Dubai from the hotel arranged for your stay. Be seated in the Luxurious land cruiser and refresh yourself with soft drinks mineral water, etc. which will be available in the car. While you enjoy your drive through Dubai city you will get to see the morning view of Dubai, which is fascinating. As you drive further, you will be captivated by the soothing beauty of daybreak and the thrilling activities awaiting you in the Skyland Tourism. Desert safaris are hugely popular for tourists visiting in Dubai, and for good reason. Most feature a mix of culture and adventure with dune-bashing, followed by a barbecue dinner in a desert camp with traditional majlis-style seating. But you can also dine out at 5 star resorts with views over the Arabian Desert. Treat yourself to an authentic meal under the sky with these four desert dining options in Dubai. Enjoy mesmerizing desert scenery and marvel at its extraordinary critters while our well-maintained Hummer claws its route via some craggy dune trails. 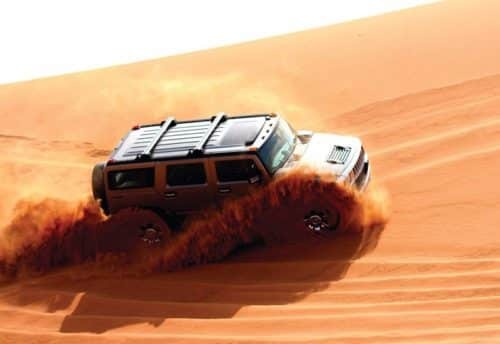 Skyland Tourism Hummer Desert Safari package provides a unique spin on admiring Dubai’s desert landscape and promises you a true outdoor adventure.So if you’re on the look-out of a different style of treat on your vacation to Dubai, then you must try this astounding yet thrilling way of exploring the desert beauty of Dubai. Contact us today itself to let our experts at Rayna Tours to help you experience the hidden beauty of the Arabian Desert. A Camel Desert Safari is the most authentic way to explore the Dubai desert by travelling on a traditional camel convoy. Camels are known as the ship of the desert because of the ease at which they elegantly move across the desert sands. Your 45-minute journey through the desert traces the footsteps of Bedouin travelers and leads you to a traditional Bedouin camp lit by gentle flames, nestled in a private Royal desert retreat. Dubai is one of the seven emirates relatively a new tourist destination world-famous for breathtaking attractions including exotic deserts to silver-sandy beach, wildlife to rich flora and faunas. Apart from its is also famous for towering sky capers, brilliant architecture or world’s biggest shopping malls gives tourists a ranges of varieties in any kind of products. It is essentially a Desert country with high-tech infrastructure, liberal policies that became popular for its excellent tourist amenities. Home to world’s some largest buildings and brilliant architecture, Dubai makes a great short break for shopping, partying, sunbathing, fine dining, sporting events, and even a few sinful pleasures.Due to its richness and high-tech infrastructure, it has the largest immigrant population in the world. The city of Dubai is located on a coastal strip bordered by deserts and gets very hot in summers but in winters it is the perfect place to get in. apart from its breathtaking attractions it is equally famous its exciting nightlife, hospitable people, fascinating culture or excellent hotels or accommodations gives world class amenities to the visitors and make them feel special. For whatever you are looking for you will be confronted with extremes or beyond your imagination. Considering tourist’s vacations or values we have strived to design Dubai packages in such way which brings top sought attractions to the visitors and give them unforgettable holidaying experience. 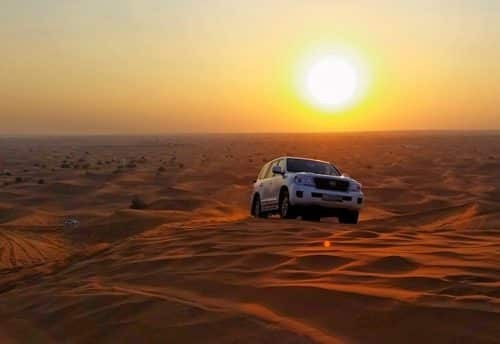 Here we are presenting the top sought attractions of Dubai to you.Come and enjoy the beauty of Desert Safari with us and we promise that you will not regret it.Visiting this Skyland Tourism is not less than a dream comes true. This is one of the cities that attracts and grasps you like a magnet, because it is safe, secure, clean and with six months of the best climates in the whole world. There are so many things to see here, not just my interest, the architecture. I may suggest you to go and see the rich heritage and culture of this Arab emirate, which may start with a visit to the Bastakia. This word is derived from the name given to a group of tribes who migrated from Iran and gave a new architecture, which turned to be a cooling system for this emirate. Then take a visit to the beautiful museum with at least 50 years of well-preserved history, then cross the creek with an abra, enjoy the ride and land at the Spice and Gold souk. Here, you do get some special spices from the South East Asian countries and Africa. Walk towards the gold souk and please do not miss to visit the diving village and the heritage village. These 2 give u a complete information about the life of the emirates during the pre oil period and those buildings in the heritage village are preserved by the UNESCO as a listed world heritage site. Now, let us talk about modern Dubai Excursions. Dubai is indeed modern and grown so much. I am sure most of the world cities will take a century or more to reach the level of Dubai. I had also been to the Palm Island; I would say that the quantity of rocks and marine sands used to build the Palm Island is so much, to indeed make this island as the 8th wonder in the world. Not far from the Palm island, you will visit the first 7 star hotel, the Burj al arab and get wonder struck as you see this great monument. Approximately 6 kms from here or a 10 mins drive, we reach the Burj Khalifa, the tallest building in the world. It is a stunning view and incredible that money can do so much. Attached to it, is the famous Dubai mall, a huge shopping mall under one roof with all the latest amenities. Also, visit the ruler’s palace and so much more through this trip of Dubai City Tour and experience the heaven on earth. If you are scheduling to go to Dubai, then journey hot has gorgeous Dubai tour packages for you. One can select packages of your choice that outfit both your pocket as well as interests. However, the charge of travel packages vary according to the sort of adjustment, tourism options, number of days of your stay and other enclosure. With Dubai holiday packages, you can naturally determine without any problems. Skyland tourism LLC make sure to offer you lots of fun on your trip. Skyland tourism LLC gives you chance to have modified tour Packages. Skyland tourism offers cheap and affordable Tour packages and Holiday packages.